Julie, this is encouraging to me this morning. It is so true > “the more we step out, the less uncomfortable it becomes.” Although I know this to be true, I am believing this to be so in this new place I find myself this morning. I am so grateful we can hold onto God’s promises as we know He is faithful. Blessings! Hi Joanne! I’m believing right along with you! Yes, where would be we without God and His promises? So glad we’ll never have to find out. Bless you! I’ve learned so much about God by “doing it afraid.” The best part of “doing it afraid” is feeling His presence right there with you through every step. Thank you for the words of affirmation for those who carry a God-sized Dream! I couldn’t agree more with you, Valerie. It continues to amaze me how His presence is felt with every step. I’m thankful we never walk alone. Thanks for your words here! Bless you! 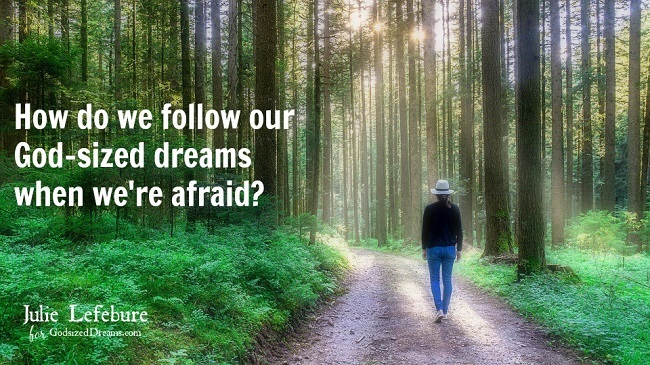 So true- if a dream is from God it will be scary because it will be more than we can handle on our own. I know that every time I’ve managed to step out and do something even if I’m afraid it has been completely worth it. Thanks for this encouragement! Lesley, way to go in stepping out of what’s comfortable to embrace what God has for you! It’s exciting to see God work in those dreams of His for our lives. Glad we can encourage one another on this journey! Blessings! Julie, this is an excellent post. I have preached that line to our now 21-year old granddaughter, DO IT AFRAID. She has learned the lesson well. Graduating from college next year! Susan, you are one wise woman! How exciting for your granddaughter to be graduating next year. Do it afraid might just be what she teaches her own kids, too, someday. Bless you, friend! Dear Julie, thank you for the encouragement to do it afraid. My job will full benefits will be ending very soon. I asked the Lord to affirm what I believe He’s called me to do, and He did…with more time to do it and working without a net. Time to turn that fear into action. Thanks and blessings! This is where the rubber meets the road, so to speak. I’m praying for you today as you step out in faith in following this call on your life! Thanks for sharing a piece of your story with us. He’s got you! Blessings! Maybe I can help with that, by confessing the righteousness of God over ourselves, which we are only by Jesus, it helps put Isaiah 54:17, the no weapon formed against us verse into action. I wish someone had told me to pray that sooner. Also it is His love that casts out fear, we have to lean into it. I understand doing it afraid, but I’d rather not be. His perfect love casts out fear. What a truth to cling to when fear tries to paralyze us! Thanks for sharing your words of encouragement here. Bless you! Thank you Julie, hope it helps. Debbie, so glad you are here! It’s a gift to journey together as we take one step at a time. Even if we have to do it afraid. Praising God we’ll never have to do it alone. Bless you and thanks for stopping in! You have given me food for thought Julie! God sized dream…mmmmm! You’re most welcome to drop by for a cup of inspiration in my God sized dream!